The place was BanshiVat (Banshi: Flute, also called Vamsi or Vansi. Vat: Banyan Tree) at Vrindavan. It was a bright moonlight night of Sharad Purnima, the full moon. Fragrant flowers were spreading their scent. Lord Krishna was playing his flute on the banks of the river Yamuna. The entire Maha Raas was so pleasurable that everyone lost track of time – Lord Krishna condensed six months into one single night. Lord Shankar was meditating on Mount Kailash. He was mesmerized by the sweet sound of the flute being played by Lord Krishna in Vrindavan. His samadhi was disturbed. 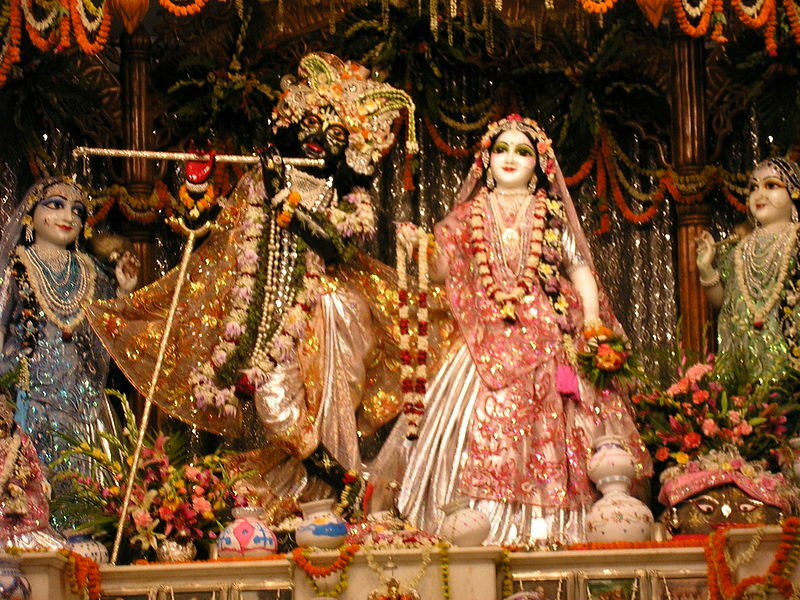 Lord Shankar left his abode and left for Vraj-Vrindavan. Parvatiji tried to dissuade him from going, but Lord Shiva did not listen to her. Lord Shiva left for Vanshivat in Vrindavan along with Shriyasuri Rishi, Parvatiji, Nandi, Ganesh, and Kartikeya. At the place where the Mahaa Raas was going on in Vamsi Vat, Gopis were standing at the entrance gate. Goddess Parvati entered the MahaRaas, but the gatekeepers did not allow Lord Shiva and others from entering. They told him that only one Man, Lord Kirshna, could be present for this Maha Raas, and no other male could be allowed to enter. Lord Shiva told the Gopis that he wanted to enter the Maha Raas and see Lord Krishna and Radha, and asked them to come up with a solution. One of the Gopis, Lalita, suggested that he should become a Gopi if he wanted to see the MahaRaas. After bathing in Mansarovar, he should take on the form of a Gopi. Lord Shiva transformed himself into a charming Gopi, and Yamunaji decorated him even further. Smiling, Lord Shiva entered the Maha Raas as a Gopi. Lord Shiva, in the Mohini roop, joined the Gopis in Lord Mohan’s Raas Leela, and started enjoying the melodious flute. Watching Radhaji and all the Gopis dance, and enjoying the enchanting flute being played by Lord Krisna, Mahadevji also started dancing.